I read a headline describing a Game of Thrones Budweiser ad and thought it had to be a joke. But, it’s not. It’s also not an early April Fool’s Day trick. What it is is a surprise crossover that caught everyone off guard. HBO’s Game of Thrones shocked Super Bowl viewers with the debut of an ad that initially appears to be a normal Bud Light promo spot. Knights are ready to joist for a king and queen while the crowd cheers, “Dilly dilly.” The joust is quickly over as one of the participants is unseated. As the knight lies prone and motionless, The Mountain walks over and stands above him. He does to the knight what he did to Oberyn Martell (played by Narcos’ Pedro Pascal), although thankfully for those munching on Super Bowl snacks we don’t see the gruesome aftermath. 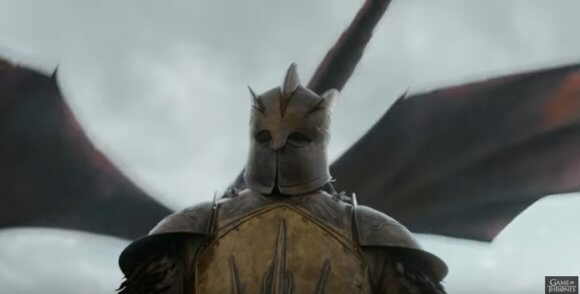 The Mountain’s attack is interrupted by the arrival of one of Daenerys’ dragons. The TV spot ends with the arena going up in flames. HBO’s set an April 14, 2019 premiere date for season eight, the final season, of the award-winning fantasy series.